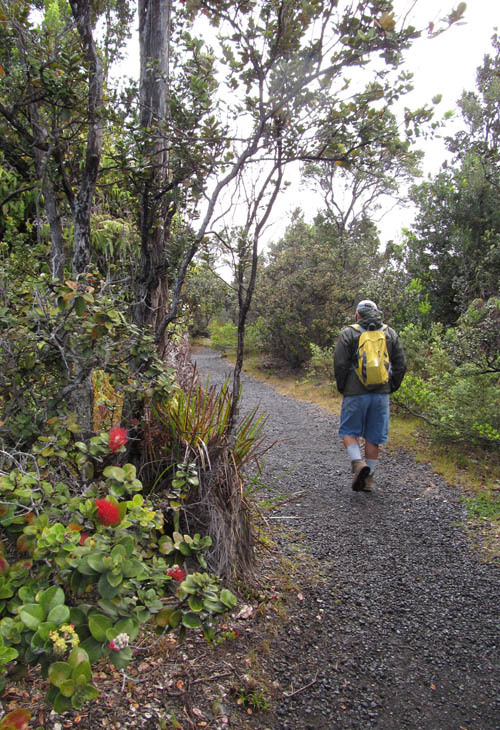 On my second day on the Big Island, we hiked the Napau Crater Trail that follows the line of craters on the east rift zone of Hawaiʻi Volcanoes National Park. 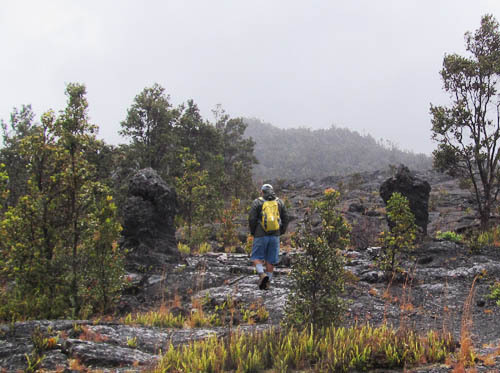 It was a cold and misty morning when Pete Morton and I embarked on the 7-mile Napau Crater Trail starting from Mauna Ulu on the Chain of Craters Road. The trail starts at about 3,200 feet elevation. There are no big climbs — just a few inclines along the way. Only 600 feet is gained and then lost over the over the 14-mile round trip. But countless lava mounds and depressions in the rugged terrain can be hard on the feet. We started the hike with jackets to protect ourselves from the cold, wind, and light misty drizzle. 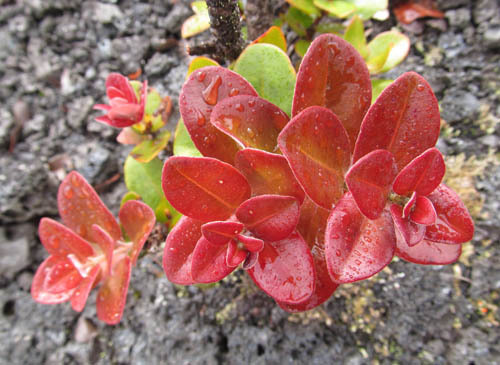 Precipitation from passing clouds covered this liko lehua — the young leaves of ʻōhiʻa — with droplets of water. 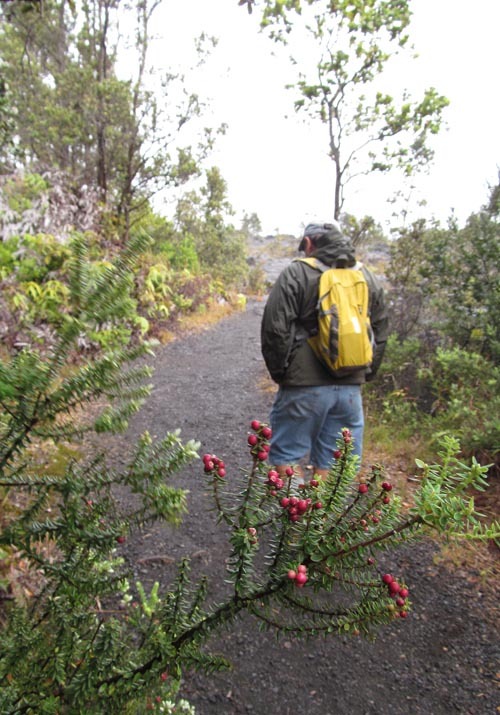 We saw a number of pukiawe (Styphelia tameiameia) with tiny red berries as we made our way up the trail. 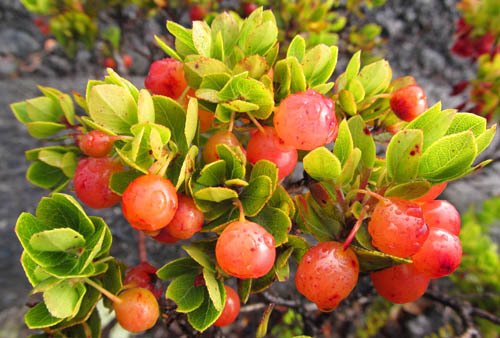 But what interested us more were the juicy yellow, orange, and red ʻohelo berries (Vaccinium reticulatum). I marvelled how these tiny little shrubs could produce so many tasty berries. We veered-off the trail briefly to see two tree molds — lava casts of big ʻōhiʻa lehua (Metrosideros polymorpha) trees — some of them with charcoal inside — incinerated during the Mauna Ulu eruption of 1969-1974. 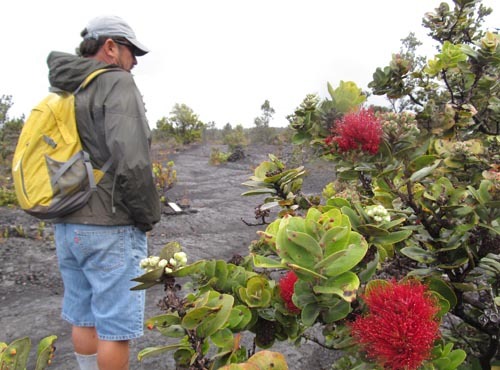 We saw a number of red lehua flowers which caught dew drops from the mist. 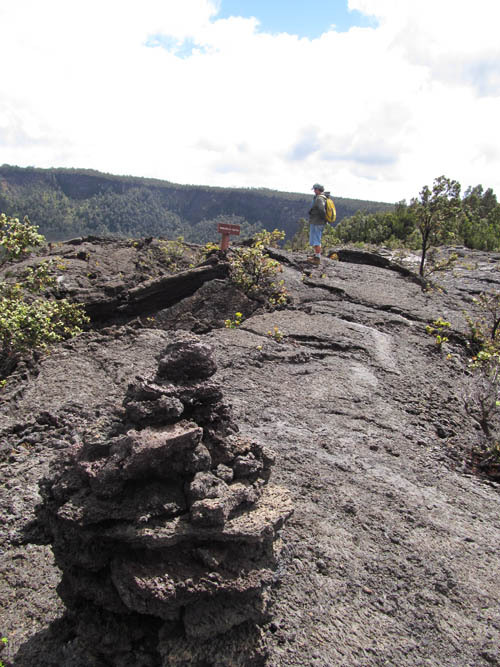 When we got to a high point — Puʻu Huluhulu — we looked in the direction we came from — towards Kilauea Caldera — and saw the plume of volcanic gases being emitted from Halemaʻumaʻu Crater. While hiking on a lava field between Puʻu Huluhulu and Makaopuhi Crater we could feel the heat coming from steam vents beneath us. Moisture from the rain seeps into the ground and returns to the surface as steam and water vapor. 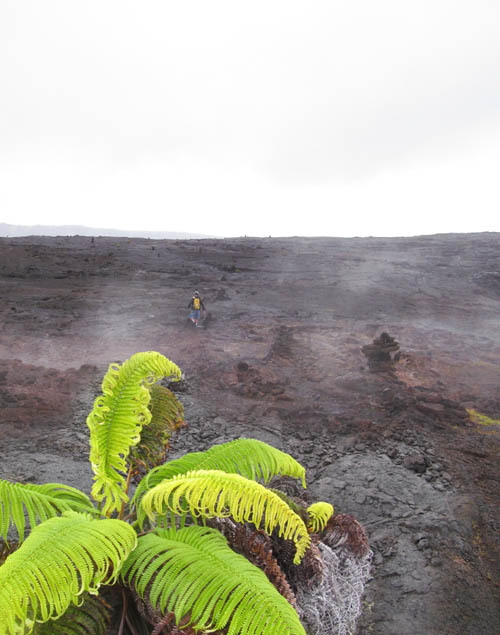 Making our way over pahoeohoe lava flows, we made our way from one ahu to another, until we reached Makaopuhi Crater. Makaopuhi Crater is surprisingly big. 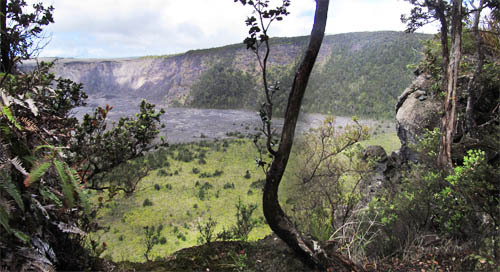 The fascinating thing about Makaopuhi is that much older forests upwind from the eruption on the edge of the crater survived and are still intact. 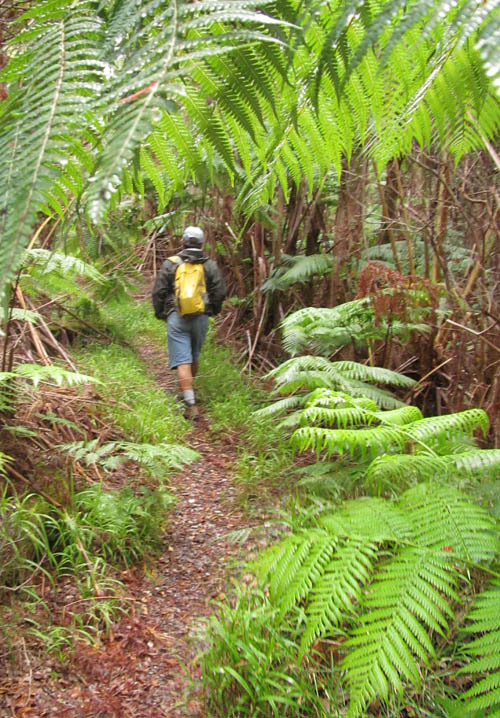 The landscape transformed in a native forest of big ʻōhiʻa trees (Metrosideros polymorpha) and hapuʻu ferns (Cibotium glauca). 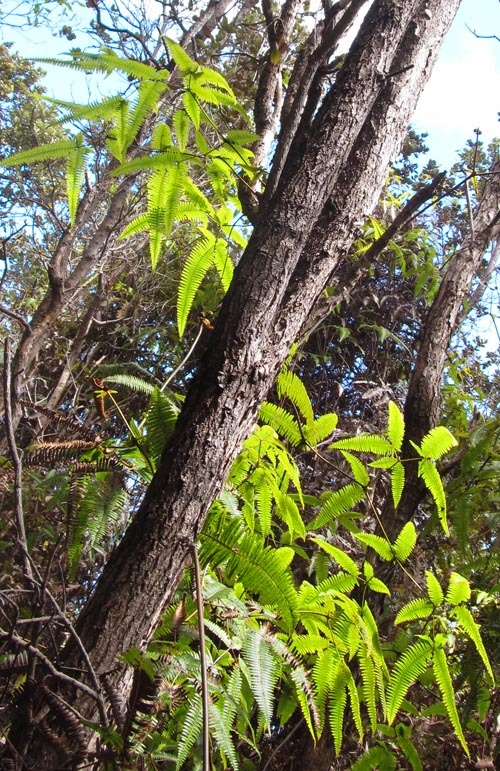 Equally pervasive were uluhe ferns (Dicranopteris linearis) which crawled up the trees and spread over the landscape. 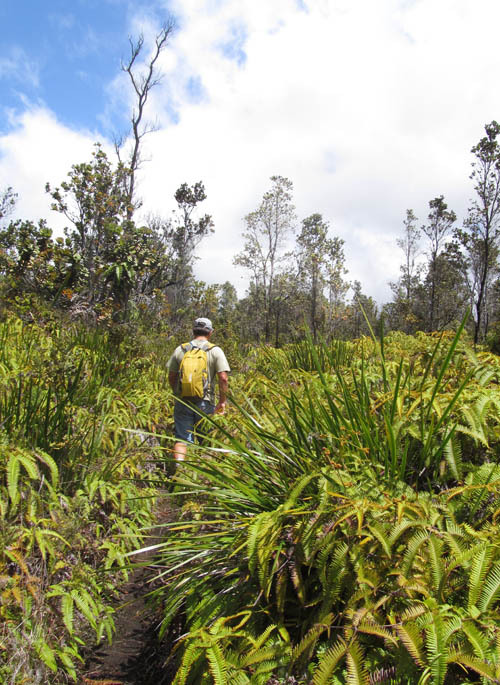 We then entered a younger landscape that was still dominated by ʻōhiʻa, uluhe ferns, and ʻuki grass but the trees were much smaller. 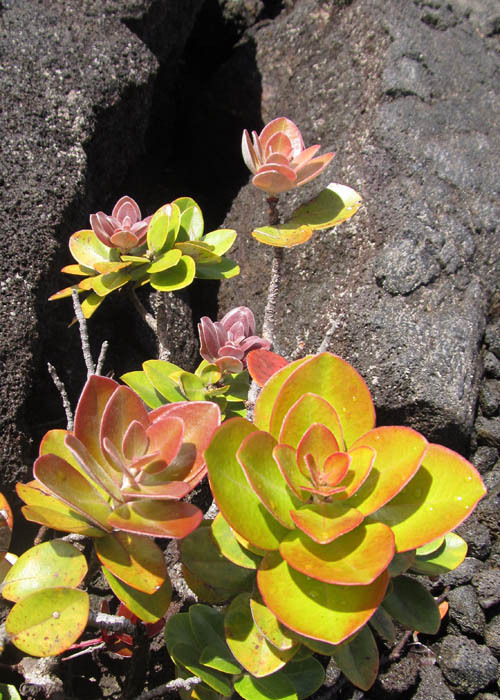 Some of the more rocky areas harbored some of the most eye-catching liko lehua. 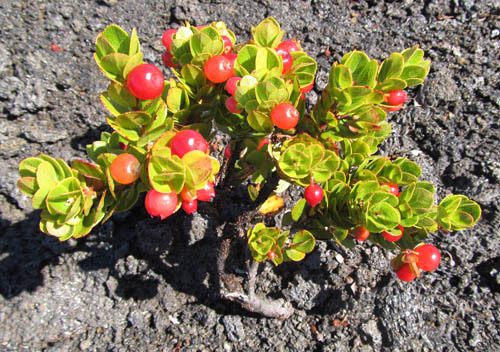 We were pleased to see more ʻohelo berries as we approached the crater edge. The trail was wide open for almost the entire way. But there was an annoying uluhe tunnel we had to duck under for about 50 feet to get to the lookout at Napau Crater. 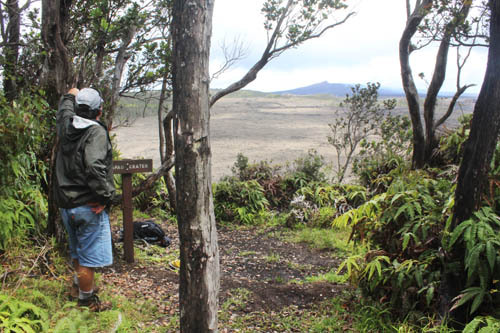 We were pleased to reach our goal — the rim of Napau Crater with Puʻu Oʻo Crater smoldering in the background. Although things appeared peaceful and calm, this area is geologically active and inherently unstable. 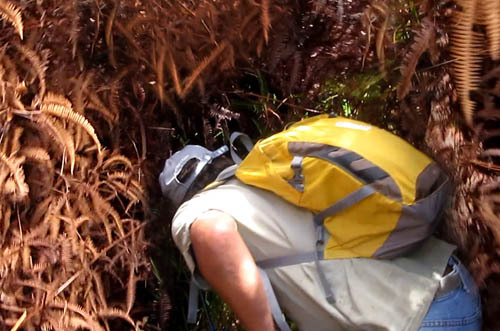 Just one year ago on March 6, 2011, there was an erruption at Napau Crater. The floor of Puʻu Oʻo crater collapsed, the lava lake disappeared, and a new fissure eruption opened up in Napau Crater! But the new fissure eruption — visible in the foreground above — did not last long at Napau. 17 days later, the lava lake returned to Puʻu Oʻo Crater and the eruption stopped at Napau. I zoomed in on the horizon and saw volcanic gases being emitted from Puʻu Oʻo. We enjoyed the lookout for quite some time, ate lunch, and relaxed before pushing off to return the way we had come. While making our 7-mile return trip to Mauna Ulu, we could see the volcanic plume of Halemaʻumaʻu far off in the distance. We could feel the heat and steam radiating from under the ground and marveled at how the land was literally being formed under our very own feet. What an awesome place to visit! The usual awesome photos and descriptions. I’m about to see if I get the video. Mahalo for your lessons in ʻŌlelo Hawaiʻi. Made the changes you identified.